The kitchen has long been cherished as the ‘heart of the home’ and it’s not hard to work out why. It’s not just a place to prepare food—it’s much more. It’s a central hub for the whole family to come together to eat, share and enjoy each others’ company. It’s a place used to chat over a cup of tea, complete school homework, share funny stories or debrief over a glass of wine at the end of a long day. It’s a place where we form many of the unique bonds that hold us together as a family. When it plays such an important role in our daily lives, the design of your kitchen is something you want to get right. Not only should it be stylish and beautifully presented, you also need it to be functional and well-equipped with everything you need. Pantry: Forming a large percentage of the storage in the kitchen, the pantry is traditionally presented as a large upright cupboard, however many of today’s home designs feature walk-in or even butler’s pantry designs. Pot drawers: Incorporating ample and easily accessible storage is one of the most important elements of good kitchen design. Pot drawers provide an effective way to make the most of the under-bench storage space in the kitchen, providing easy access to items stored at both the front and rear of the space. Overhead cupboards: Typically used to store glasses, mugs and other smaller items, overhead cupboards use the vertical space above your bench to provide additional storage. 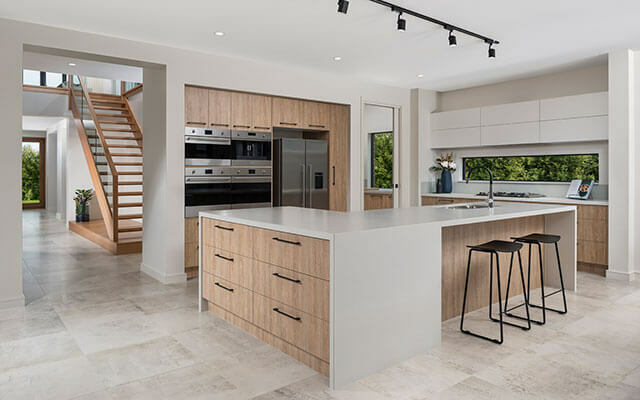 Overhead cupboards can be combined with a combination of open shelving and lift-up cupboards to add to the overall design and functionality of the kitchen. 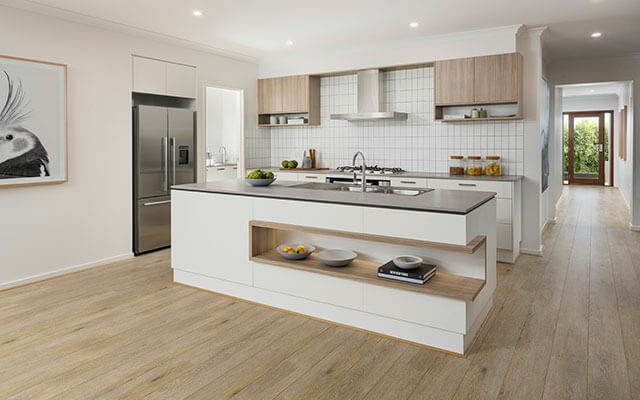 Splash back: Not only does the splash back protect your walls from heat, oils and spills that are inevitable when cooking, they also provide an opportunity to incorporate a point of interest to the overall look or design of the kitchen. Cooktop: Whether you prefer an upright oven and cooktop combo or a stand-alone cooktop with integrated oven, opting for quality 900mm/5 burner stainless steel cooking appliances will make meal preparation easy and add to the value of your home. Rangehood: Opt for either a canopy or concealed rangehood that is the same width as your cooktop, to provide sufficient protection for your cabinetry. Island bench: A highly desirable feature in any gourmet kitchen, an island bench not only looks great, but also provides ample bench space and an additional informal seating area. Sink: Whether you opt for a standard double bowl or double bowl with drainer, the sink is ideally placed in a central location in the kitchen and should be within close-proximity of the dishwasher. Tapware and Handles: Your chosen tapware and handles will add the finishing touches to the kitchen and should be chosen to complement each other. 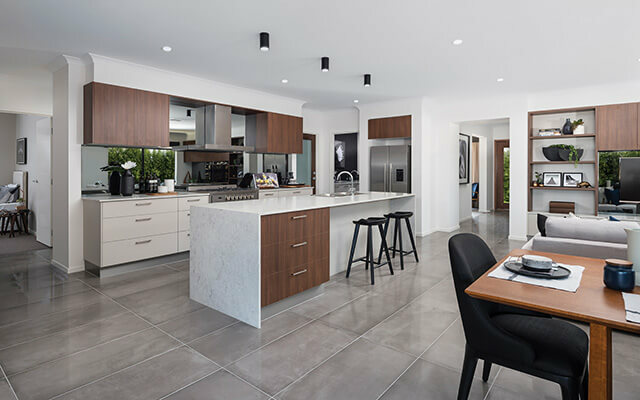 When you build with Dennis, we make it so easy to design the perfect kitchen, starting with an invitation to your personal colour consultation with one of our professionally trained interior designers, who will walk you through all the options to create a kitchen design that is perfectly suited to your personal tastes and preferences. We give you the flexibility to design a unique kitchen tailored to your unique requirements, for example, when you opt for one of our Inspirations series homes with Premium standard inclusions, you can take your pick from eight island bench styles, eight overhead kitchen cupboards and four fridge overhead cupboard styles, making it so easy to design your ideal kitchen. Visit a Dennis Display Centre to find out more about how we can help you create your ideal home, complete with the perfect kitchen.